Red Bull design guru Adrian Newey has vowed to crack the issues that led to a "stressful" Australian Grand Prix weekend, despite Sebastian Vettel's stunning start to the new Formula One season. Vettel cruised to victory by 22 seconds in Sunday's curtain-raiser at Melbourne's Albert Park after crushing his rivals in qualifying for the ideal opening to the defence of his world title. However, in the eyes of perfectionist Newey, behind the scenes it was a different story as Red Bull grappled with an issue they are still struggling to come to terms with. "It was quite a stressful weekend in Australia. 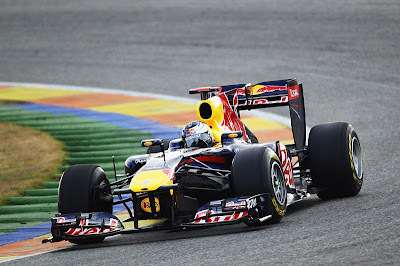 There were a lot of rumours about our KERS system for a start," said Newey. Vettel's glorious beginning is all the more remarkable because he did not run with the KERS power-boost system all weekend. At present, Newey is hopeful, but cannot say for definite, whether Red Bull will use KERS at the next grand prix in 11 days' time in Malaysia where it will be far more beneficial. "The intention going into the weekend was actually to run a full KERS, but we had some reliability problems, so we had to take it off. We hope it will be in the car in Malaysia, but first and foremost we need to try and field a car that is reliable, and if we feel it is that then we will try to race it." Asked if it was required given the way Vettel crushed his rivals, Newey added: "Well it gives you a benefit at the start where you might be outgunned. McLaren also made a huge leap forwards - by copying our exhaust system, it has been said - and I'm sure they'll be pushing, so we can't be complacent." Newey has described the problem as "relatively trivial," although refused to expand other than to state it was one developed by themselves. Cryptically, he added: "We're not experts in that field, so we're on a steep learning curve, and we'll make a decision on the Friday evening in Malaysia." Newey was speaking at the Segrave Trophy Awards lunch held at the Royal Automobile Club in London where he collected the honour for 2010. Commemorating the life of Sir Henry Segrave, the trophy is awarded to a British subject with the 'spirit of adventure' for the most outstanding demonstration of transportation by land, air or water. Newey received the award for being the only Formula One designer to have designed championship-winning cars with three different teams, Williams, McLaren and Red Bull. With the list of winners reading like a who's who of British greats from Newey's hero in Donald Campbell, to Stirling Moss, Sir Jackie Stewart, Nigel Mansell, Damon Hill and Lewis Hamilton, the 52-year-old felt humbled. "To receive such an illustrious and distinguished trophy like this, it almost sends shivers down my spine when I look at the names who have received it in the past, the history of it," said Newey. "I've tremendously enjoyed my career, and been privileged to work with some great people. I can honestly say I've just about enjoyed every single working day of it. Everything else has been a bonus."